Humanomics Smith Vernon L., Wilson Bart J.
Auteurs : Smith Vernon L., Wilson Bart J. While neo-classical analysis works well for studying impersonal exchange in markets, it fails to explain why people conduct themselves the way they do in their personal relationships with family, neighbors, and friends. In Humanomics, Nobel Prize-winning economist Vernon L. Smith and his long-time co-author Bart J. Wilson bring their study of economics full circle by returning to the founder of modern economics, Adam Smith. Sometime in the last 250 years, economists lost sight of the full range of human feeling, thinking, and knowing in everyday life. Smith and Wilson show how Adam Smith's model of sociality can re-humanize twenty-first century economics by undergirding it with sentiments, fellow feeling, and a sense of propriety - the stuff of which human relationships are built. 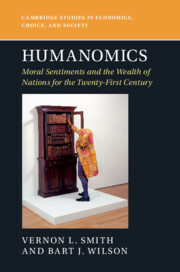 Integrating insights from The Theory of Moral Sentiments and the Wealth of Nations into contemporary empirical analysis, this book shapes economic betterment as a science of human beings. 1. Humanomics spans the two worlds of Adam Smith: sociality and economy; 2. Words and meaning in Adam Smith's world; 3. Conduct in the social universe; 4. Frank Knight preemptively settles the horse race; 5. Axioms and principles for understanding human conduct; 6. Propositions predicting context-specific action; 7. Propriety and sympathy in a rule-governed order; 8. Trust game discoveries; 9. The ultimatum game as involuntary extortion; 10. Designing, predicting, and evaluating new trust games; 11. Reconsidering the formal structure of traditional game theory; 12. Narratives in and about experimental economics; 13. Adam Smith's program for the study of human socio-economic betterment: from beneficence and justice to the Wealth of Nations. Vernon L. Smith is the George L. Argyros Endowed Chair in Economics and Finance at Chapman University, California. He was awarded the Noble Prize in Economic sciences in 2002 for, 'having established laboratory experiments as a tool in empirical economic analysis, especially in the study of alternative market mechanisms'. He is a founding member of Chapman University's Economic Science Institute and Smith Institute for Political Economy and Philosophy, and is a Distinguished Fellow of the American Economic Association. Bart J. Wilson is the Donald P. Kennedy Endowed Chair in Economics and Law at Chapman University, California. He is a founding member of the Economic Science Institute and founding member and Director of the Smith Institute for Political Economy and Philosophy. He has been co-teaching humanomics courses for nearly a decade with professors in the Departments of English and Philosophy.